Colin UrquhartLearn why we can only taste all that the Father has in store for us through HisHoly Spirit when we know what it is to be a friend of His Son. 128 pages, fromMarshall Pickering. This significant new book from one of the most well-known and accessible Christian writers in the world is centred around John 15:15, where Jesus says, "I no longer call you servants -- now I call you friends." 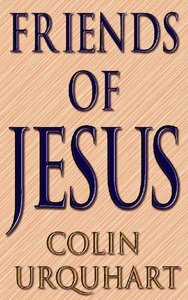 Colin's latest book explores in depth the full implications of what it means to be a "friend of Jesus". With his usual lucidity and spiritual insight, he carefully unpacks the biblical material and gives simple and practical teaching on how we can live as friends of Jesus. The emphasis of this book is that the Father wants more than our obedience, he wants our love, and the Holy Spirit delights to work in our personalities, transforming us into the likeness of Jesus himself. This is the way to real intimacy with God. The latest book from popular Christian writer Colin Urquhart is centred on John 15:15, where Jesus says, 'I no longer call you servants - now I call you friends'. Urquhart explores in-depth what it means to be friends of Jesus.